Gale Glassner Twersky, A.C.H. is a hypnotherapist/HypnoCounselor who is board certified in Advanced Clinical Hypnotherapy. She is a top-selling CD and book author, intuitive, motivational speaker and president of Glassner Associates Hypnosis for Personal Growth and Wellness since 1999. Gale's HypnoCounseling practice was based in Montclair, NJ from 1999-2009 before relocating to the Los Angeles, CA area in 2009. Gale has specialty certifications in Past Life hypnosis, Hypno-anesthesia and Spiritual Counseling. 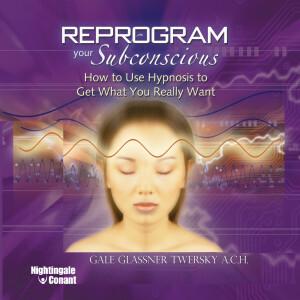 Additionally, Gale heads the Glassner Associates' certification program in Reprogramming Hypnosis for hypnosis professionals who desire to practice using the theories of her nine-CD program, Reprogram Your Subconscious. Gale's background also includes five years as an English and Oral Communications high school teacher, Individual Events speech team coach, and Director of Speech Activities in Wheeling, IL. While still a new teacher, Gale took a course in self-hypnosis, and so began her passion to alert everyone about hypnosis as an amazingly effective tool to harness the power of one's subconscious mind. In that same year, Gale took her first course in spiritual development, where she became aware of her strong intuitive abilities. In 1991, she founded a personal growth and spiritual development group that has continued meeting for more than 20 years. In 2002, she authored and recorded the hypnotic guided imagery CD, Relax, Release and Dream On that has achieved #1 ranking for spoken word downloads. Furthermore, Gale wrote a monthly informative column on hypnosis and HypnoCounseling for Montclair Life and Leisure newspaper for seven years. In 2010, Gale was honored as the recipient of the International Hypnosis Federation Award for Excellence in Communication.